In early 2016, I attended a baseball and softball hitting and pitching clinic in St. Louis. Among the presenters was the pitching coordinator for the New York Yankees. While I enjoyed much of his presentation, I couldn't help but be deeply disturbed -- and confused -- by something. On one slide he displayed a picture of Mariano Rivera who he said, and I agree, had excellent pitching mechanics. Then, on literally the next slide, he displayed ASMI's guidelines that call for 32 to 76 degrees of External Rotation at Stride Foot Contact. The problem is that, as the pictures above and the clip below show, Mariano Rivera's External Rotation at Stride Foot Contact is significantly greater than 76 degrees. What the New York Yankees pitching coordinator said was desirable was clearly and directly contradicted by what Mariano Rivera did. And what Nolan Ryan did. And what Pedro Martinez did. And what David Price does. And what Justin Verlander does. I would submit that, if your pitching biomechanics model is telling you that the pitching mechanics of Mariano Rivera -- and a host of other dominant and durable pitchers -- are flawed, then I would suggest it's more likely that the flaw is with your model. How can a pitching biomechanics model become so detached from reality? ASMI isn't the only big name to give out what in my opinion is dangerous advice. The Mayo Clinic is selling as the mechanics of a safer fastball what in my opinion are in truth the mechanics of an incredibly dangerous fastball. I discuss my theory about what's going on and why in The Problem. I became concerned with what ASMI was advocating starting with literally the first study I read. Lyman's et al's 2002 paper Effect of Pitch Type, Pitch Count, and Pitching Mechanics on Risk of Elbow and Shoulder Pain in Youth Baseball Pitchers, which was co-authored by Dr. Glenn Fleisig and Dr. James Andrews of ASMI and David Osinski of the affiliated ABF, remains one of the most astounding, and mystifying, things I have ever read. If a movement reduces the risk of elbow and shoulder pain, then how is it a flaw? I don't have a problem with labeling those four movements flaws going into the study, but to maintain that view after finding that they reduce the risk of elbow and shoulder pain? USA Baseball recently put together Playball.org, a site devoted to youth baseball. On that site are two pieces on pitching that reflect ASMI's current pitching mechanics model. The problem is that these pieces, while well-intentioned, will likely worsen the epidemic, not improve things. The thing that alerted me to the possible existence of a problem was the frequent occurrence of my least favorite word. It fails to question the conventional wisdom about pitching mechanics, which is problematic given the epidemic. It ignores the history of the game; what the best, most dominant and durable pitchers did. As the front leg strides forward, the two arms swing down, apart and then up. The throwing hand should be on top of the ball during this motion. Why should the hand be on top of the ball? While this is a widely-used cue, and you do see it in some pitchers, it isn't present in the arm actions of many dominant and durable pitchers. At a minimum, that means it's more likely style than substance and isn't necessary to throwing hard or well. What's more, and as I discuss at length in The Science Behind The Epidemic, evidence exists that prolonged internal rotation and delayed external rotation, which is what keeping the hand on top of the ball promotes, are problematic. Yes, Roy Halladay did keep their hand on top of the ball for some portion of his arm swing, but my analysis of Roy Halladay's arm action reveals that what he actually did is what many people say he did. The forearm should be at about a 45-degree angle above horizontal at the instant of front foot contact. Why 45 degrees when that's not what you see in dominant and durable pitchers? In my experience, dominant and durable pitchers exhibit closer to 90 degrees of external rotation at Foot Plant. If the forearm is already vertical or past vertical, then the arm is too "early." Conversely if the forearm is not up enough -- that is, the hand is not much higher than the elbow -- the arm is too "late." While I agree that an arm that is early can be just as big of a problem as an arm that is late, I do not believe the sentences above are the best way to make this point. The thing is that the forearms of Greg Maddux, Mariano Rivera, Tom Seaver, Nolan Ryan and other great pitchers' arms were vertical at Foot Plant. I'd have a hard time taking seriously any view that these dominant and durable pitchers' mechanics were flawed because their arms were vertical at foot plant. Some would say that the Lyman 2002 study is irrelevant due to its age. However, I see the same problematic attitude; labeling as flawed the pitching mechanics that have worked for some of the most dominant and durable pitchers to have every played the game. What's worse, the words don't even match up with the pictures below. While I'd argue that 45 degrees of external rotation is Foot Plant is half of what you see in dominant and durable pitchers, I don't even see 45 degrees of external rotation in the pictures above and below. Instead, I see a much flatter arm that is closer to 15 degrees. That in my opinion is highly problematic and something that I call Flat Arm Syndrome. 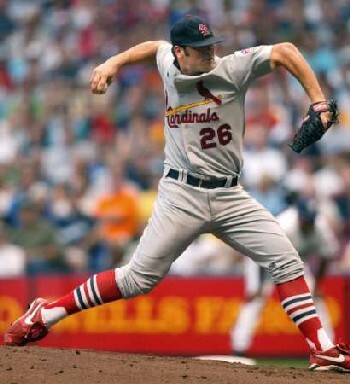 For some pitchers, the arm is so late that at the time of foot contact, the hand is below the height of the elbow. The colloquial expression for this is "Inverted W."
I do like the phrasing of this comment on the Inverted W because it focuses on when the Inverted W is always a problem; when it hurts the pitcher's Timing and causes their arm to be late, as is the case in this picture of Anthony Reyes. While I like the comments above, I am not at all a fan of what comes a few lines later. Next is the "arm acceleration" phase. Comments like this were the catalyst for my putting together my Revised Baseball Pitching Cycle. In truth, the arm acceleration phase starts much sooner than the conventional baseball pitching cycle, and the words of this piece, imply. That's important because, if you don't understand when the arm (actually) starts to accelerate, you can't understand what it's put under load. ASMI advocates something that I call Premature Pronation. The pitcher begins their movement toward the plate with the break phase. In the break phase, the pitcher should be focused on the catcher's mitt. This is when the ball and glove separate, and the throwing motion begins. The glove, throwing arm, and stride should all move in synchronization with each other. It is important that the pitcher's head stays over their throwing-side foot when they begin their movement forward. The glove-side elbow should be used to pull the throwing shoulder through. The throwing hand fingers should be on top of the ball, with the arm working through a down, back and up progression so that the ball is ultimately pointed towards second base. The stride should be with the glove-side foot and made in line with the target. The stride foot should land even with the throwing side foot that is engaged with the rubber. What is the justification for pointing the ball at second base, other than it's what (pretty much) everybody teaches? There's certainly no historical justification for this cue; most dominant and durable pitchers don't point the ball at second base. What's more, there are two problems with advice like this. First, in advocating pointing the ball at second base, this piece reinforces a problematic movement pattern that I call Premature Pronation. Second, and as I discuss in Proper Pitching Mechanics it evidences an unquestioned acceptance of the conventional wisdom about pitching mechanics. That is a big enough problem in the industry; it's even worse when an institution like ASMI makes the same mistake. When the scientific establishment mindlessly follows the industry instead of leading it. The glove-side elbow should be used to pull the throwing shoulder through. Pulling with the glove-side elbow will tend to disrupt the kinetic chain by bypassing the core. In sum, by ASMI's standards and their pitching mechanics model, many of the greatest pitchers of all time -- pitchers who were both dominant and durable -- demonstrate flawed pitching mechanics; pitching mechanics that deviate from what they advocate. For instance, in the picture above, which shows Mariano Rivera at what I call the Ready Position, he is demonstrating too much external rotation at foot plant. The same for Justin Verlander and David Price, below. However, I would submit that if, according to your model, the mechanics of some of the greatest pitchers to have ever played the game are flawed, it's likely your model that in truth is flawed, not them. I believe that part of the problem with how Timing is evaluated and taught is due to the phrase Stride Foot Contact. While all (people) may be created equal, in my experience the same isn't true of Stride Foot Contact patterns; I have seen different SFC patterns have different implications for the start of Torso Rotation. I believe that helps to explain some of variation in results between studies. I prefer to use Foot Plant as a milestone because, in my experience, it is a more reliable marker for the start of Torso Rotation and the loading of the pitching arm. I believe another significant part of the problem with ASMI's pitching mechanics model and Tom House's pitching mechanics model is that they are reliant on pitchers coming to them. As a result, if the greatest pitchers don't come to them for testing, then they won't be factored into their model. In my opinion, that is a huge problem and an explanation for why the epidemic isn't getting any better. The Inverted W is something that we look for during our biomechanical evaluations here at ASMI. It's essentially a combination of late external rotation and high shoulder abduction at the moment of foot contact during a pitcher's delivery. Both of these issues have been demonstrated to lead to problems that can result in injuries requiring surgery. Low external rotation at foot contact (what we call a "late arm") results in higher stress on the elbow. The ideal angle of shoulder abduction is 90°, because the bones and the soft tissues supporting the joint are able to move the most freely and most efficiently. When the arm is raised higher, the soft tissues in the shoulder joint become impinged, or pinched against the shoulder socket, and can cause injury. So when you add these two things together in the Inverted W, a pitcher can really get into trouble.